It never fails. 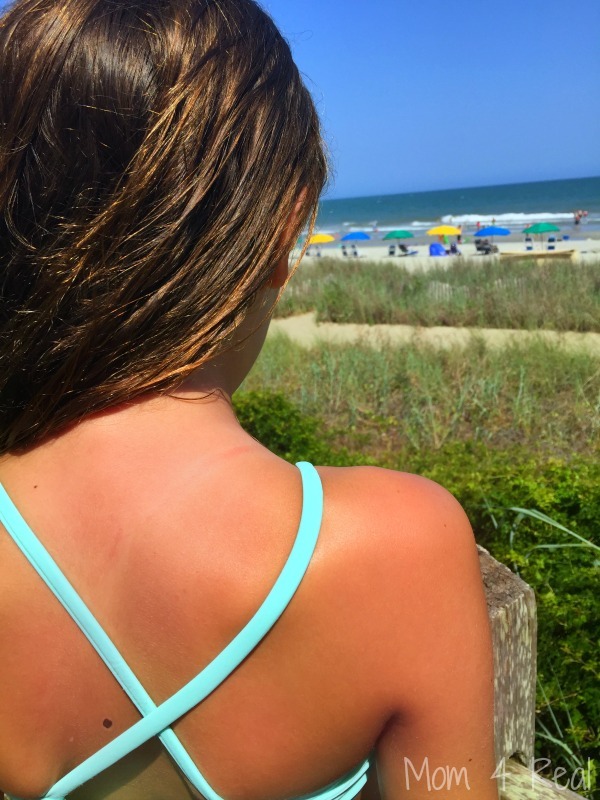 On the first day of vacation, somebody in our family gets a sunburn. We apply sunscreen diligently, but sometimes that’s just not enough, and someone ends up in pain. 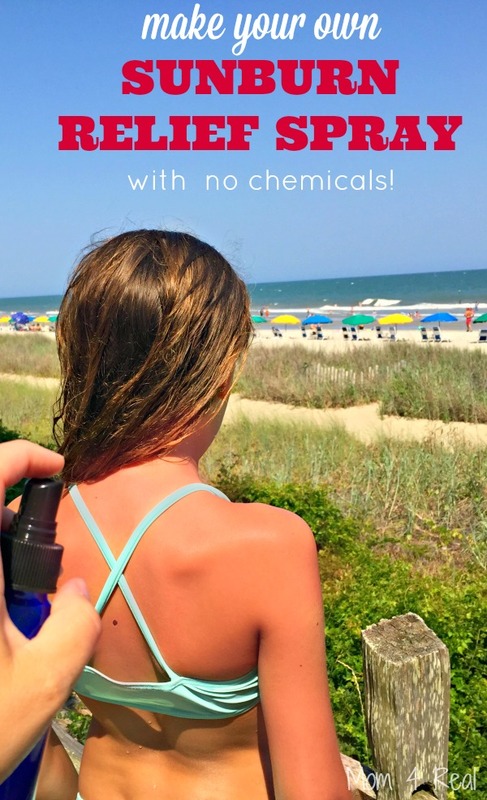 This year, I decided to make some sunburn relief spray using my essential oils and take it with me. That way, if someone got a sunburn, we would be ready! I’m so glad I did too, because of course, it was needed. This post contains affiliate links, which means that if you make a purchase using these links, I will receive a small commission. The Lavender Essential Oil is a natural burn remedy with anti-inflammatory and anti-itch and pain reliever for any type of burn. The Peppermint Essential Oil provides an immediate cooling sensations and is also a great anti itch and anti inflammatory. The witch hazel is great for pain, itching, inflammation and minor burns. The Vitamin E will help moisturize the skin. These things together will provide relief and help skin heal a bit quicker and maybe even prevent peeling! This spray is also great for bug bites or just to spray on after a day at the beach or the pool! It smells amazing too! Looking for more natural solutions for your home and body? 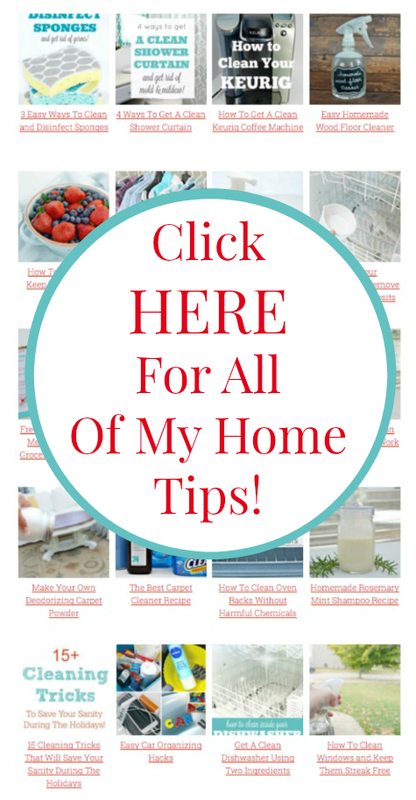 Visit my Home Tips Page HERE for all kinds of easy tips like how to make your own bug repellent, homemade all natural ant repellent spray and tons of cleaning tips! I just made mine tonight & it works perfectly! I did use Vitamin E capsules instead by cutting them open. Smells great & feels sooo good on a sunburn! What we need is a homemade sunscreen or sun blocker to prevent getting burned in the first place. If you have any ideas on how to make one please forward it..Thanks. AL. There are great recipes for homemade sun protection. Are you using an 8 oz. spray bottle? I have almond oil on hand, will that substitute for the Vitamin E oil? What size spray bottle did you use for the sunburn relief spray? I have some 2 oz bottles. I am making them for our church camp. My thought was the nurse would have individuals and could let the camper take it with them to use after showering. I received first degree burns and small second degree burns from hot tea spill. I mix all these ingredients plus Almond oil and besides tingling a little it feels good. will know more in the morning. This spray really does work to soothe sunburn! I’ve been putting grapeseed oil in mine just because that’s what I have on hand. I have also used it as an after-shave on my legs and that sensitive bathing suit area. I’ve made up a separate batch with some clary sage essential oil added for those pesky hot flashes! Hi. This is going to sound way off the grid, but it helps for instant relief. By taking a cloth, and pouring white vinegar straight on the cloth, and lay it directly on the sunburn. I swear by this, I am not joking. It gives instant relief! I have fair skin, and burn easily. The only downfall in this is you’ll probably want to take it outside to apply, as it does smell strong, and you’ll probably peel.It’s hard to believe, because you’d think it would really sting, but IT DOES NOT! You’re kids will thank you when the pain is instantly gone. I spilled some by accident on myself, and that’s how I knew IT WORKS! REALLY! I don’t know what everyday use would do though. I only used it for the few times I got burned in the summer. When it’s 90 outside, I stay indoors. HAPPY SUMMER! There are no citrus EOs in this recipe so could it also be put in a plastic bottle?